And onward I go with my obsessive reading of Seanan McGuire’s October Daye series! I just finished the 10th book, Once Broken Faith. Here are a few thoughts on this terrific book, plus the bonus story included with it. My thoughts: Ooh, another good one! Once Broken Faith is another suspenseful, exciting, and nerve-wracking journey through the inevitably blood-stained days of October Daye — hero of the realm, and all-around trouble-shooter. In Once Broken Faith, the monarchs and nobles of Faerie (or at least, those who rule on the North American continent) come together to determine whether a cure for elf-shot will be allowed to be distributed, or will be surpressed for the next century or so. Elf-shot is a weapon used by pureblood Fae who, bound by an injunction by Oberon himself against killing one another, seek another way to get their enemies out of the way. A pureblood who’s shot with elf-shot sleeps for 100 years, and while the Fae essentially live forever, no one really wants that long a nap. But the cure has become a political hot-potato, and each attendee at the convocation has his or her own motivation for either putting it to use or keeping it off-limits. And as a changeling (part-human), Toby is considered an intruder and beneath notice by many of the nobles. Still, as a knight and hero sworn to service, it’s her duty to investigate the murder of a visiting king, and things only get worse from there. Once again, Toby herself is placed in grave danger, and this time, she faces the all-too-real risk of losing the people she loves most thanks to the manipulations and simmering quest for violence of some of the nobles. And once again, I felt like my own heart was going to stop at some points in the story… I won’t say why, but if certain events had gone differently, I think I would have had to either throw the book out the window (except I was reading on my Kindle, so no) or put it in the freezer. I absolutely love these books, but sometimes I think they’re not good for my blood pressure! I was so on edge and tense for the last third or so, and it really was touch and go there for a while. I love how so many of the characters we’ve met come together in this book. Toby’s world has really expanded over the course of the series, so that now we know not only her closest allies and the rulers of the Duchy she’s sworn to, but also neighboring kingdoms and even the High King and Queen. I also love seeing how Toby’s circle of allies have truly become her family. It’s a strange family, sure, but the love and commitment are unmistakable. Plus, a new short story! When circumstances present her with the chance to have her brother back again, is there any chance she can refuse? But when that restoration proves to come with a terrible price, is there any chance that just this once, she can win? 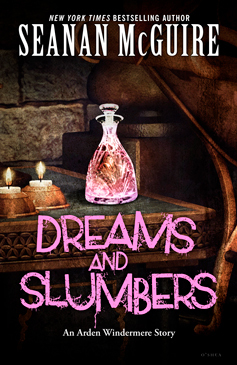 “Dreams and Slumbers” was originally published in the print edition of Once Broken Faith, released in September 2016. Copies are available from a bookstore near you. Do not read this story before reading the book! My thoughts: One of the things I love about the spin-off stories in the Toby-verse is getting a chance to see other characters’ points-of-view. All of the main novels are narrated by Toby, and it can be a pretty cool change to see what the people who interact with her really think about her endless adventures. In Dreams and Slumbers, Arden Windermere narrates her attempts to wake her brother from his eighty years asleep under the power of elf-shot. Arden is a truly interesting character — someone born to royalty, but who spent most of her years hiding out in the mortal world. From Arden’s perspective, it’s Toby’s fault that she ended up back on the throne instead of living a quiet life as a bookstore clerk. Sure, the throne is where she’s supposed to be, but it’s definitely not an easy life. 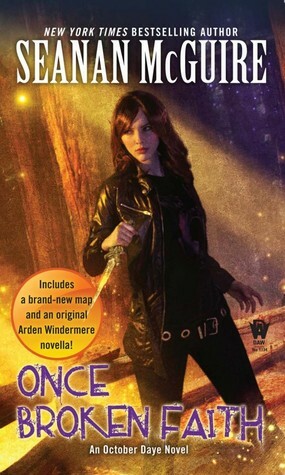 This is a great story that lets us get to know Arden (and a few other characters) a little better, and I’m sure the outcome of Dreams and Slumbers will come into play in the next novel. No big surprise here — I loved Once Broken Faith and Dreams and Slumbers. The characters all seem to be growing and developing, and I love getting more insights into their lives and relationships. Moving straight ahead with #11, The Brightest Fell. And I hope I’m not heading for a disappointment… because they’ve been talking about a wedding for a couple of books now, and I want to see it happen, dammit! My goodness, you fly through these! I love when I get into a book or series and want to do nothing else! What will you do when you finish?